Hotel Himalayan Darshan is an eco-friendly resort spread in 2 acres with with Oak, Rhododendron, Lime and Pear trees in Kausani. The Resort provides a blissful state of wellness and rejuvenation for those seeking a luxurious resort experience. Himalaya Darshan resort Kausani offers a breathtaking view of snow covered mountains and lush green valley from the private patio of the cottages. Make the most of your leisure by involving in activities like nature trail, jungle walk, village visit, birds watching and various indoor and outdoor activities. 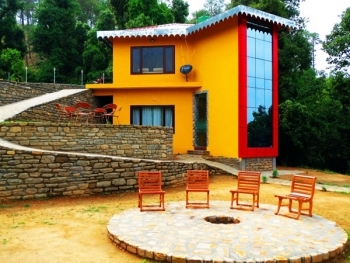 Himalaya Darshan resort Kausani is located at a unique location with stunning Himalayan views and hundreds of acres of untouched forests all around. Just perfect for savouring Kausanis exquisite calm atmosphere. Himalaya Darshan resort Kausani has 8 luxuriously furnished cottages facing the panoramic Himalaya Range with private balcony. 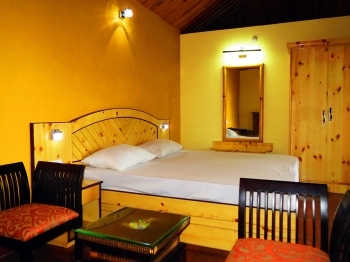 Each room offers the best facilities and modern amenities to make your stay comfortable. There is Multi Cuisine Open Garden Restaurant in Hotel Himalayan Darshan Resort. There is a wide open space adjacent to nature for you to enjoy tea, coffee, Hukka, and more. - Well appointed room facing Himalayas with balcony. - Daily Breakfast as per our menu plan. - Children under the age of 5 years complimentary. - Child (5-12 years) 25% of the above tariff with an extra bed in the same room. - Above 12 years 35% of the above tariff with an extra bed in the same room. - 15 Days Prior to Check In: No Cancellation Charges. - 15/7 Days Prior to Check In: 50% of the full amount would be charged as retention. - 7/3 Days Prior to Check In: 75% of the full amount would be charged as retention. - 72 Hrs Prior to Check In / No Show: 100% of the full amount would be charged as retention. By Train: Kathgodam is the nearest railway station from Kausani, which is about 142 km away. One can hire a taxi or chose a bus to reach Kausani Himalayan Darshan Resort. By Bus: Kausani is very well connected by state owned bus services. Bus services connect Kausani to other hill stations like Almora, Ranikhet, Nainital and Pithoragarh. Many overnight buses owned by private companies ply between New Delhi and Kausani.